There are so many ways to interact with people these days, and to think that when I began this blog in 2007 when all I had was this blog, and maybe a MySpace? Today, there are many who only know me from this blog, others from my Instagram, TV appearances and even though I've been writing for Los Angeles Magazine since 2010 (I was even nominated for an Ellie) I still get people emailing me about posts from this blog. It's great to see that Street Gourmet LA still is a source to people out there looking for the good stuff. Recently I've received emails about tips in Latin America and even to meet up in Baja, well those carefree days of meeting random people (That was a mixed experiment) in Baja and taking people across the border have come to an end. Even finding the time to answer my work emails is non-existent. I've become in demand for work as a writer, consultant, on-screen guide and fixer for TV shows and now have a tour company, Club Tengo Hambre, based in 3 markets. I'm constantly traveling to Latin America for job related activities, and with all these commitments, my free time is rare and my weeks are spoken for; sometimes only allowing a few slots a year for family and dear friends. With that said, I'd like to direct you to Club Tengo Hambre, and the carefully curated tours I've developed, which are experiences you'd receive if you were to go there with me. We have a street food and craft beer tour coming up on February 20th where you'll sip on Mexican craft beers poured by the producers paired with legendary street food vendors. Yes, you'll be going to La Guerrerense. Our guides treat you like a good friend, and we take out all of the variables: transportation, directions, being in the right place at the right time and knowing the menu, that can prove a challenge to even the most seasoned travelers. 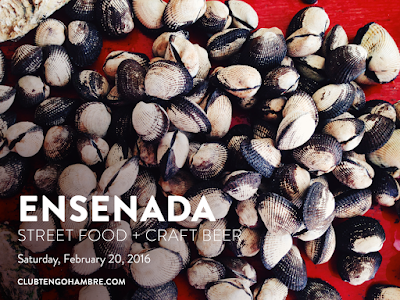 Get to know us on February 20th with tostadas and beer. Buen Provecho!